Number 1 singles and albums are pretty hard to achieve. Even harder - a career made up entirely of chart-toppers. Although, it must be said, the odds of managing that are somewhat increased by not releasing that many records. 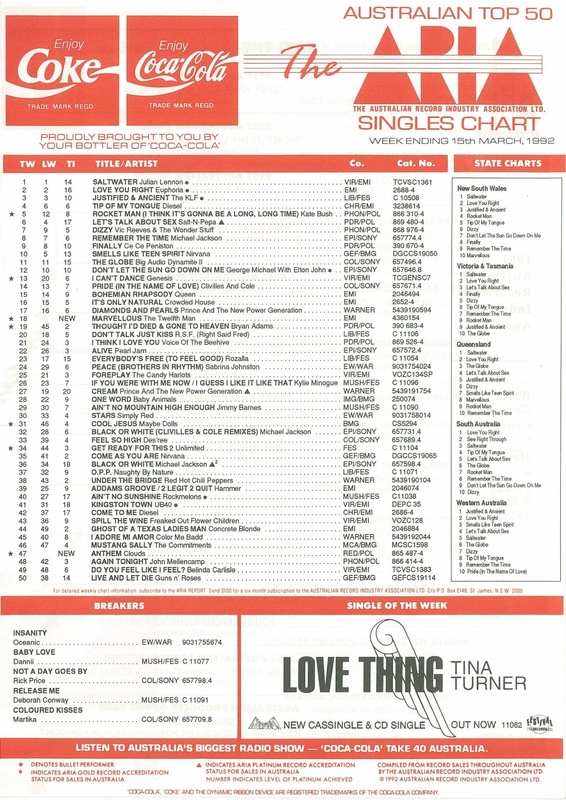 In 1992, an Australian comedian maintained his flawless (up until that point) chart record by sending a second single to the top of the ARIA chart. Yes, there'd been an eight-year gap between singles, but in that time, he'd also notched up two number 1 albums. He'd add a third chart-topping album to his tally by the end of the year. This week in 1992, the song that would eventually make way for Mr Consistent held on to the number 1 spot. 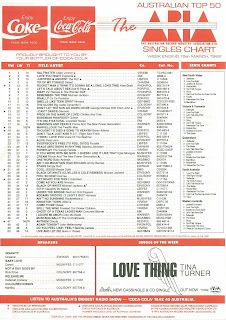 "Saltwater" by Julian Lennon remained on top for a second week. Their first - and biggest - US hit, "The Humpty Dance", hadn't registered in Australia, but the ever-evolving hip-hop group's second Billboard top 40 single sneaked into our top 100. Another Texas single, another woeful chart position in Australia. This second release from Mothers Heaven also became the band's lowest peaking song in the UK - a record it held until 2013. Peaking two places lower than previous single "Hieronymous", The Clouds seemed to have run out of steam - but not in my house. One of my sisters was a massive fan of The Clouds and since she had Penny Century on pretty high rotation, I'd often hear "Anthem" emanating from her room in the gaps between whatever songs I was playing in my room - probably Euphoria and 2 Unlimited at this point in time. Whether or not it was because I was worn down by the repeated exposure, I actually quite enjoyed the melodic indie-pop of The Clouds, but unfortunately for the Sydney band, they'd never be seen on the top 50 again. Because I'm only just recapping the ARIA charts from 1984 this year, I'm yet to cover "It's Just Not Cricket", which I'll get to in June. But suffice it to say that the chart-topping comedy release had been a monster record, ending 1984 as the second biggest single of the year. Since then, The 12th Man (aka comedian Billy Birmingham) had scored two number 1 albums with 1987's Wired World Of Sports and 12th Man Again! in 1990. And so by 1992, Australia was more than ready for him to pay another visit to the singles chart. "It's Just Not Cricket" had been a comedy routine in the vein of "Australiana" (which Billy had written) - except with racist jokes about Pakistani team members' names instead of gags about koalas and pavlovas. "Marvellous", however, was another type of record altogether. Essentially a rap song by Billy as Richie Benaud and various other members of the Channel 9 cricket commentary team, it seems more than a little inspired by "Do The Bartman". Helping Billy out on backing vocals were some big names - John Farnham, Diesel, Jimmy Barnes and Glenn Shorrock, as well as other local musos like Graham Bidstrup and Dave Steel. 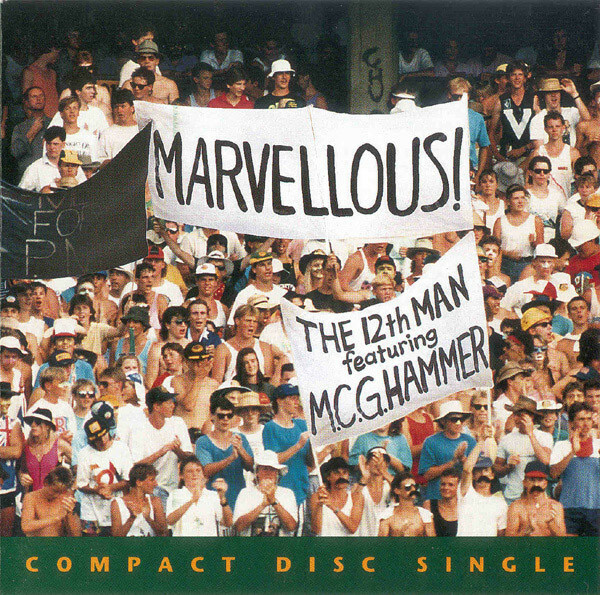 Since I watch about as much cricket as I listen to comedy records, I'd never been swept up in The 12th Man craze and so you can probably guess what I thought of this track. But true to form, "Marvellous" maintained Billy's perfect track record of number 1 releases - and I could certainly admire that. Next week: the latest revamp of the ARIA chart finally goes national, while one of the week's new entries comes from the male singer who gave Southern Sons' Jack Jones a run for his money in the hair and power ballad stakes. Wow I've never heard the song. 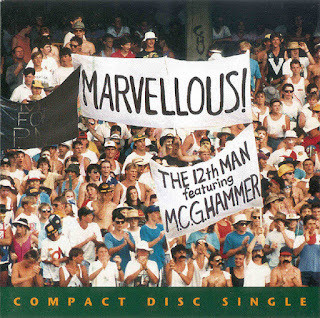 I'm a massive cricket fan so I've heard of 12th man & 1987 Billy Birminghams album but never came across this one. Not a bad rap song with the good old commentary names like Greigy, Richie, Lawry but a little annoying with marvellous repeated like 6 times. I don't remember the Texas song. The Clouds' song is OK, but I'm surprised it did as 'well' as #47. About the only 'sport' song I like is New Order's 'World In Motion'. I hated The 12th Man. Even the 'featuring M.C.G. Hammer' bit was lame and a year too late by this point. "Anthem" by the Clouds is ace! I really liked the video, done in a single take with this lens-stretch effect right at the end. Still a great track. As for the 12th Man, why he didn't make a video for "Marvellous" I'll never know. Anyone remember him saying "Gravy, booby! I mean, groovy, baby!" when introducing the song on Take 40 Australia?